When you hear of TOMS Shoes, you generally think of their amazing generosity and charitable efforts when it comes to shoeless children in poor countries and their basic comfortable flat shoe - not necessarily fashion and style. Your opinion will change when you check out the great new additions to their Summer 2012 Collection (see some above). The Strappy Wedges (which come in either a cork or rope heel) are featured in various colors, patterns (stripes, ethnic prints, and solids) and fabrications. Two examples are the above Tierra and Cenna, both are 3 1/4" heel wedges which feature the classic TOMS suede insole with cushion for comfort. The Peep-Toe Wedges, like the above Pilar and Corbel (also available in cork or rope heel), come in various colors, textures (like a natural basket weave) and prints. 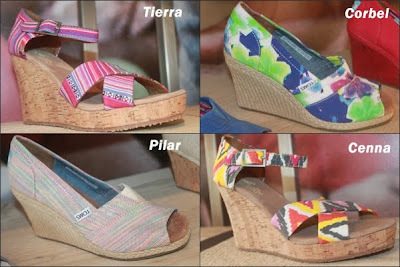 Some of these style also has TOMS's newest feature - matching DYED CORK wedge heels. As with all TOMS shoes, with every pair purchased, TOMS will give a pair of new shoes to a child in need. As of September 2010, TOMS has given over one million pairs of new shoes to children in need around the world.